A version of this post appeared on the Constant Contact blog in December 2012. When you think about nonprofits and social media marketing, you probably assume that these organizations are primarily using social media tools to fundraise. Without money, you can’t provide services or pay the staff who carry out those services. Actually, most nonprofits are going social to build relationships. When asked about social media goals for the 2012 Nonprofit Social Network Benchmark Report, nonprofits said their top three were growing their base, engaging members and growing fundraising. Two out of the three priorities focused on recruiting volunteers and supporters – growing and maintaining relationships. So how can a nonprofit use social media to grow their volunteer base? That’s a question I answered recently for several nonprofits by presenting a session on social media during a November volunteer breakfast at the United Way of North Central Massachusetts. The key is using the right content for your organization to engage your audience, inform them about your mission, and then recruit them once you’ve built a relationship. Engaging your audience means sharing content that encourages them to act – you can see how successful that content is when people comment, share, like, retweet, and repin. What kind of content is engaging? Multimedia – Use photos and videos to engage your audience. The Pajama Program provides new pajamas to children in need, and their photos of smiling kids and families are a powerful way to tell their story. I couldn’t find one of the hundreds of their Facebook photos that didn’t have some fan interaction. Inspirational – Get your audience thinking about what they can do to help. UNICEF has an entire Pinterest board of inspirational quotes and photos. Asking a question – The Girl Scouts got a lot of mileage on Facebook recently just by asking a few questions: “So we’d love to hear your good news about girls: what skills are they learning? What educational trips have you taken? In what way have they awed and inspired you?” That simple post got 186 comments, 422 Likes, and 35 shares. Humor – Animal photos and humor are a natural fit for The Humane Society. Every one of the pins on their cute animal photos Pinterest board have been repined. Your nonprofit might not have anything to do with animals, but sharing funny content is always a good idea. Social media allows nonprofits to interact with their audience on a daily basis. Take advantage of that interaction by informing your audience about your mission. Share your news – This is basic, but it’s important. Regular posting of your accomplishments, announcements and events help to remind your fans of the vital role you serve in your community. Education – Your knowledge is valuable – use it to educate your social media audience. The ASPCA has a Pinterest board full of pet care tips. Each pin links to a full article on the organization’s blog. Events – Definitely invite your followers to events via social media, but make sure you’re posting after the event too. Event photos and video allow you to show off your hard work. Make sure you tag participants – people, sponsors and other nonprofits – in your photos to get more traction like the United Way of North Central Massachusetts did during their annual Day of Caring. As your fans interact with your content, their networks will see it, allowing you to spread your message even further. You’ve engaged and informed your followers, and formed a connection with them. They’re thinking about you on a regular basis and they support your cause. Reach out to them through social media to recruit them as volunteers. Share links to your volunteer opportunities – You can post the link and add a description on Facebook and Twitter, but don’t forget about Pinterest. The San Antonio, TX Food Bank has a Pinterest board of volunteer opportunities and donation drives. Talk about your industry – The Massachusetts Service Alliance, which works with dozens of nonprofit agencies, shared this Americorps infographic about what just one Americorps member contributes through their work. It shows your followers how they can make a difference. Use statistics – The Red Cross has posted daily Hurricane Sandy relief updates on Twitter, including volunteer needs. They tweeted that 90% of their 5,700 workers helping with Sandy relief are volunteers, and linked to a website to sign up for Red Cross opportunities. Try LinkedIn – The Heart of West Michigan United Way posts opportunities on their LinkedIn page, and they link to their website, which has a volunteer matching service. Need more social media help? 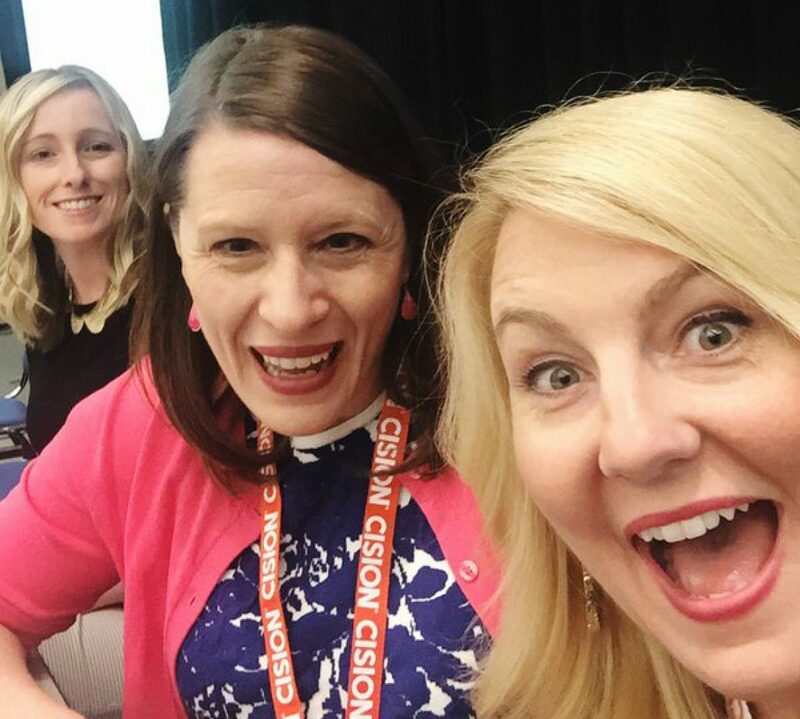 Check out my slides from my social media presentation, Engage, Inform Recruit: How to Use Social Media for Volunteer Growth.